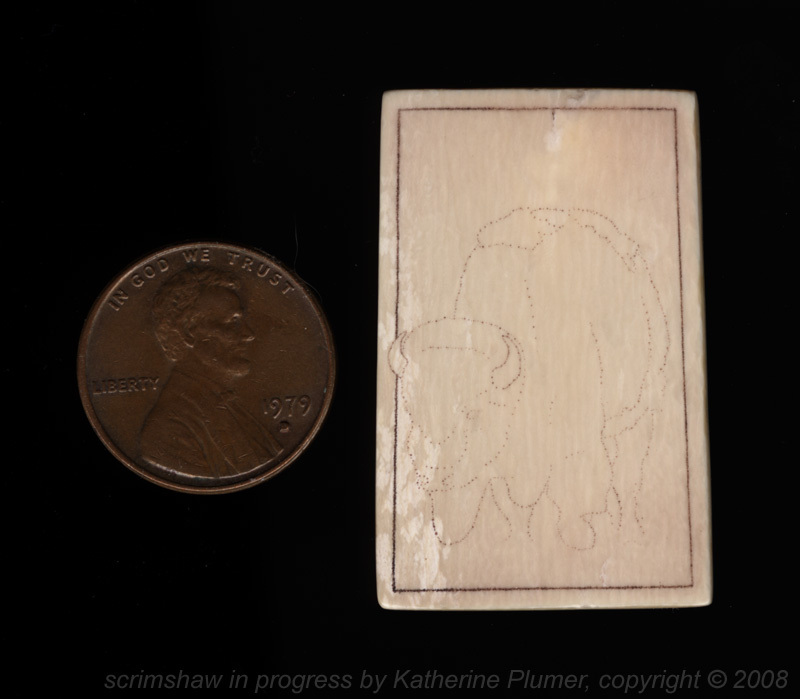 So in my quest to explore all scrimmable surfaces, I am now going to try mammoth ivory. The little card I got with this stuff says most of it's about 15,000 years old. That boggles my mind. This being my first time working with this stuff, I consider this fairly experimental. Chances are a lot of people reading this have vastly more experience with it than I do, but I'm going to see what I can do, figure out what type of ink will be best, how to prep the surface, etc. I do have an image (or at least a subject) in mind for a final image. I will be starting with the piece pictured on the right, it has more cracks in it, so I'm more willing to sacrifice that one if I mess up, but hopefully I won't do that. 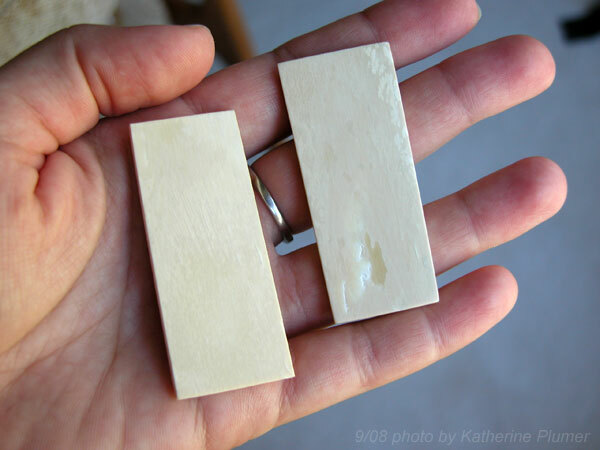 These are both pretty rough, so the first step is to sand them down "glassy smooth." This is the worst part for me, I'm terrible at this! 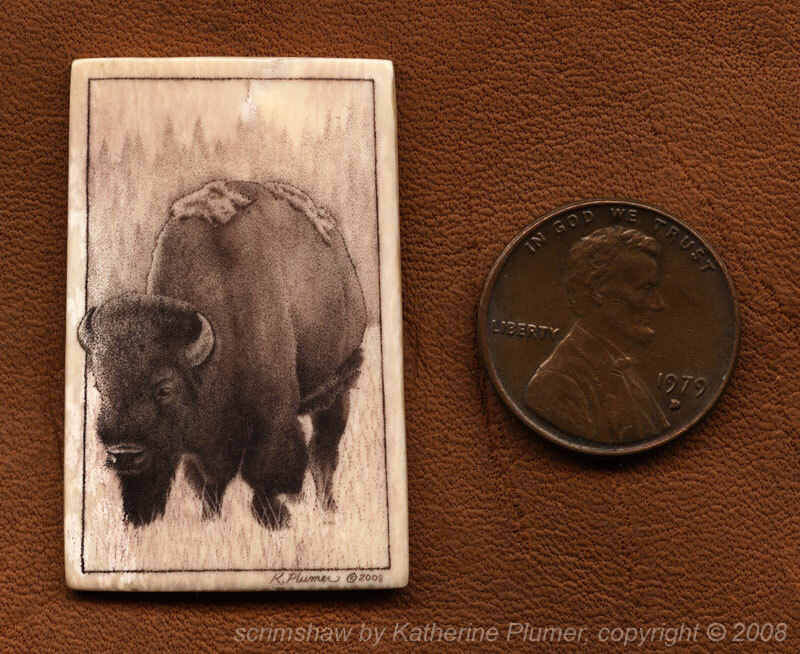 Goal of this project: figure out how well I like mammoth ivory, experiment with different techniques and figure out the best way to handle the material, and hopefully in the end come up with a good scrimshaw! Yikes. Anyone had this problem? I stopped working on it, can't sand it when it's all lumpy like that, and I set it out to dry. It's dry today and has almost completely returned to normal but I can still see the "hills and valleys" that formed yesterday. Soooo, I guess I'll be dry-sanding it. And I think that's a good indication that I'm going to have to seal it before I even think about inking it! Hey, good thing I said this was experimental! Okeedokey, a little dry sanding and we're back in business. It's not glassy smooth yet but at least I've got the hills and valleys leveled out again. Sheesh. 1) use this piece as scrap to test ink and texture and sealants but forget doing anything nice on there. I can do a nice image on the other piece, which is not cracked. 2) cut the end off and go for it! Waste not want not. Use the cut off end for practice. I'll have to ponder this, I need to work on a drawing now anyway, but I think I'll go for option 2, it'll just change the shape of the artwork I plan to use (which is fine, long skinny images are hard to compose anyway). Well here's something really un-pretty to look at! 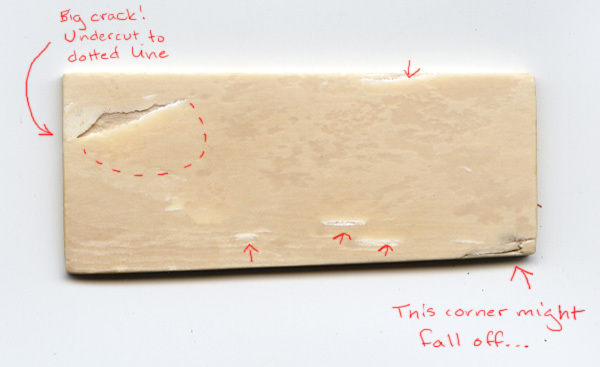 I went ahead and cut one end off that ivory slab. It still has one big crack on it, but that'll be on the backside. I'm using the cutoff piece for practice. I mean, I'm comfortable with scrim techniques, it's just that every surface handles differently so I'm hesitant to just dive in without sticking my toe in the water first, and as long as I have a scrap (unlike with the micarta last time around) I ought to make use of it. This was a quickie thing with zero attempt to make it look good, so pardon the ugliness. 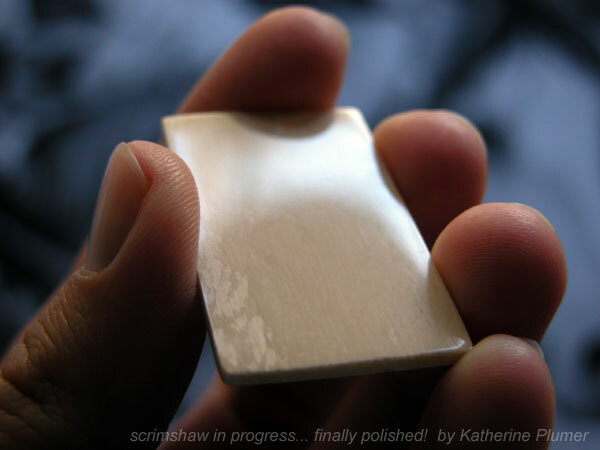 I polished this to 4000 grit, was going to use fabulustre but forgot (oops), and then just poked some holes and made some scratches. 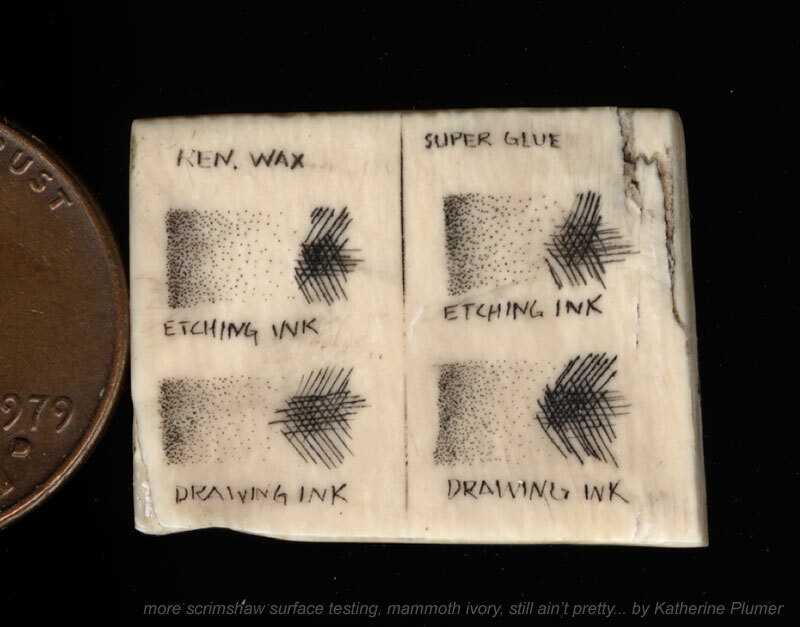 One part got etching ink, the other part got drawing (India) ink. I expected the India ink to stain and bleed like mad, considering yesterday's water incident, but although it dried INSTANTLY on the surface it came right off with a damp q-tip. So, that surprises me. I'll be curious to see if anything changes over the next day or so. Oh, and it IS soft! Wow! That'll be great for dark areas, but I'll have to be super duper careful not to accidentally scratch it. I'll try sealing the other side and do the same thing again. Ren Wax or Super Glue... heck maybe I'll divide it in half and try both. I feel a little funny going through all this because I'm sure plenty of you know exactly how to handle mammoth ivory, but this is how I go about learning. Okay, more surface testing today, hence another ugly scrap to look at. I flipped that little piece over. Half if it had Super Glue applied, and then the entire thing was sanded to 4000 (pardon the ginormous cracks...) The other half then got a coat of Renaissance Wax, and I did a little test of etching ink and India ink on each half. Hmmmm, and it all looks pretty much the same. The Super Glue side does have a different feel to it. Although there is no glue on the surface, it feels harder and does not raise much of a burr, whereas the other side did. Nothing seems to be bleeding or staining, even on the unsealed side (to my complete surprise). I really don't like using India ink, it's a pain. 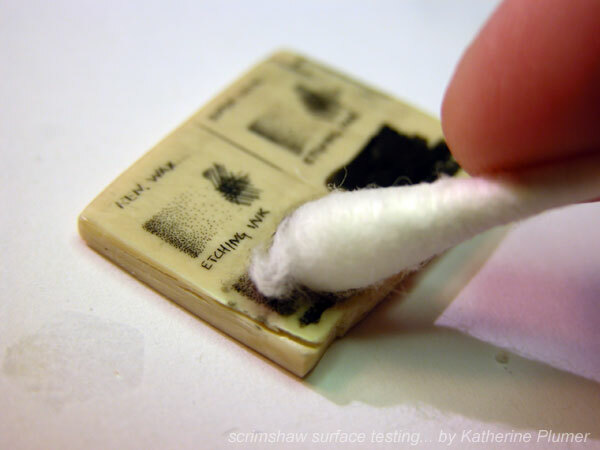 It dries instantly all over the surface I have to go at it with a damp q-tip to remove the excess. Etching ink is really more my style, it just wipes off easily. 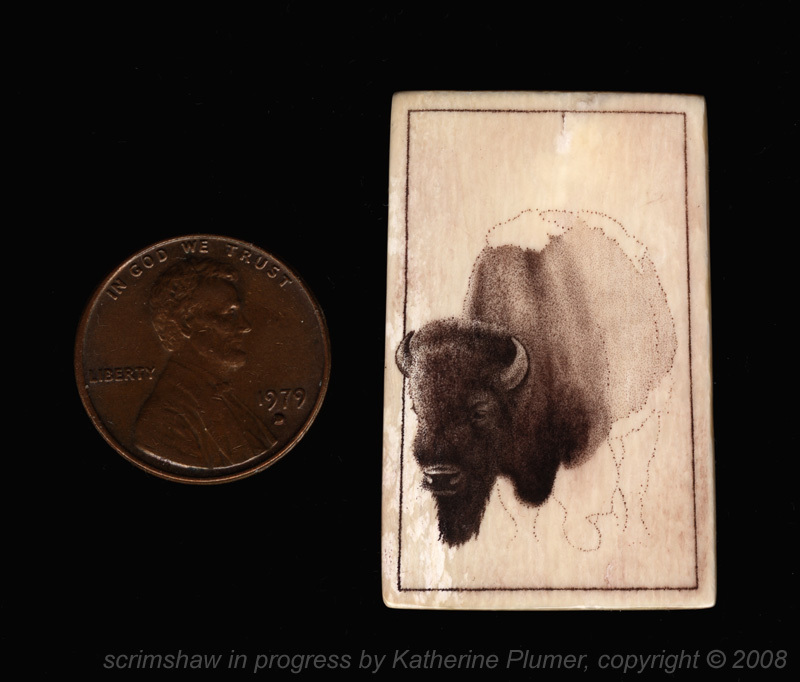 But I've not had great success using etching ink for color work (going to talk about this more in a separate tutorial). So for b/w scrim I think I'll stick with etching ink. Probably for good measure I need to seal this mammoth ivory just to be on the safe side, since I know this piece absolutely DOES absorb liquid. I'm going to give this little scrap a couple days to see if anything changes (like ink bleeding out from the lines/dots). Stay tuned! I need to sand/seal the final piece and get the image all sketched out anyway. Well, the consensus seems to be that I've just got a bad piece of ivory here and that mammoth ivory isn't all like this. Good to know! :yesnod: It's not chalky, just has a lot of cracking. I can scratch it with a fingernail, but I have really hard fingernails so that doesn't mean much, I can scratch the elephant ivory too. The trouble with doing these work-in-progress things in "real time" is that everyone sees when problems arise! Oh well, that's okay, learning process all around. Stubborn and hardheaded as I am (oh yes, some of my endearing traits), by golly this is going to work!!! I'm not giving up on this one (what a boring tutorial that would be!). Actually it looks a lot better ever since I chopped the end off. Well, at the moment it's a little weird looking because I sealed it with super glue tonight and haven't yet sanded it down. 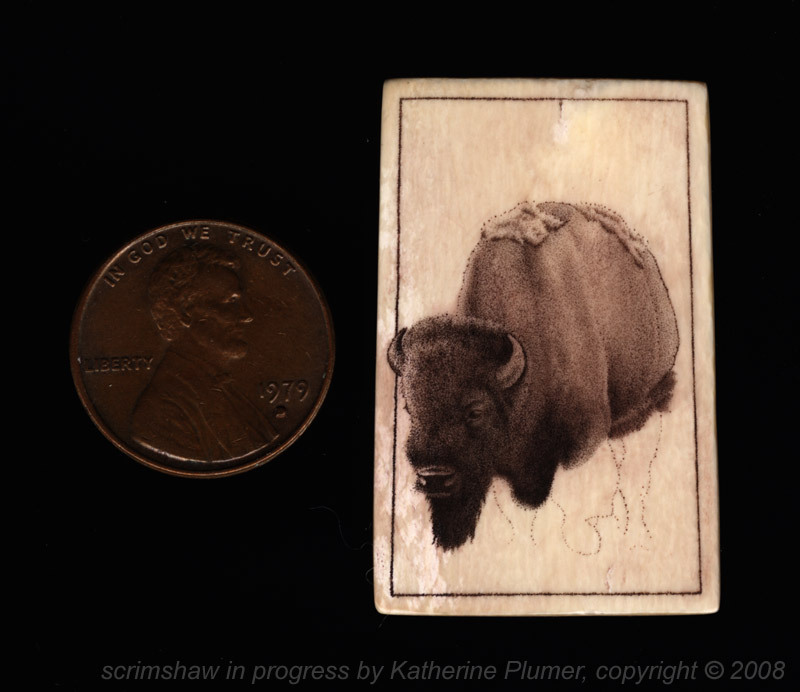 I did not photograph this process, I was a bit distracted trying not to glue the ivory to my hand, or my desk, or anything in the vicinity. Anyway, with all the glue I used it ought to be darn well sealed. The idea here is that even when you sand the glue residue off the surface, it has still sealed all the pores so the ivory won't absorb things it's not supposed to absorb (this is the first time I've tried this). So next up with this project is finish sanding, draw the image on paper and get the tones and composition figured out, scan, shrink, transfer, scrim, etc. Oh, I'm working on a highly experimental color project. That one has high danger of disaster so it'll be an "after the fact" tutorial if it comes out at least halfway decent... I confess I'm addicted to posting work in progress on line and writing about it, I'll gleefully make tutorials out of everything I do. 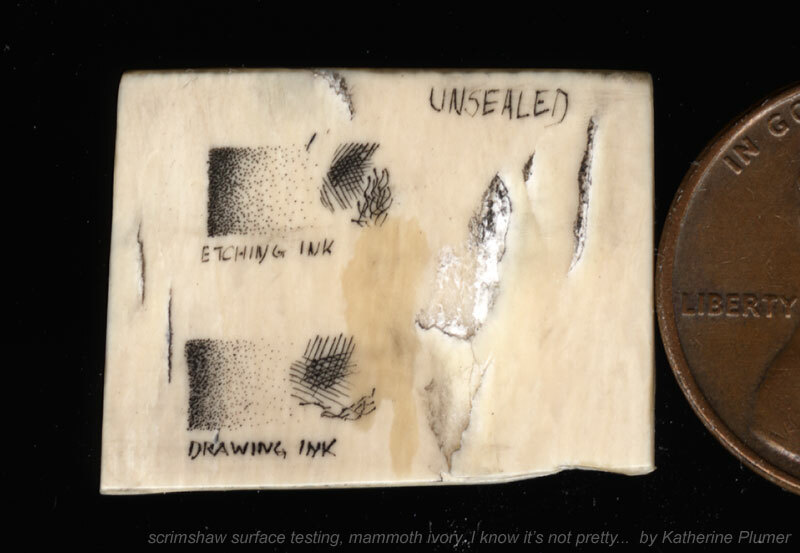 I was asked to expand on the topic of sealing the ivory (I think?). Okay. Bear in mind I've never done this before, but I'll act like I know what I'm talking about. 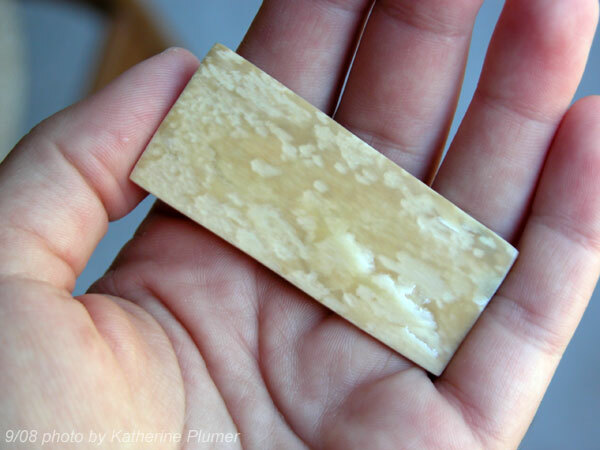 I was told, and have read, that you can seal a porous surface (such as bone, or this particular piece of ivory) by applying a coating of super glue. Well, I always thought that sounded pretty weird, I mean who wants to scrim on super glue, doesn't that look ugly, so I never wanted to try it and just avoided porous things. 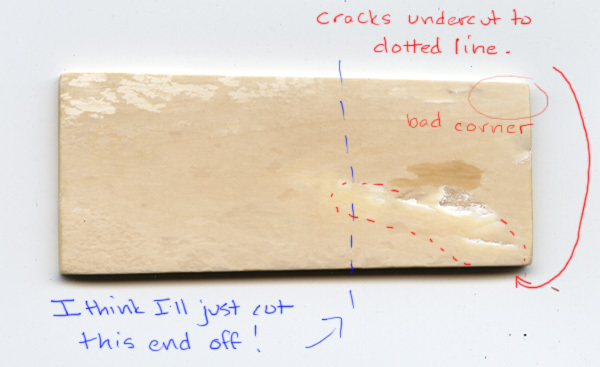 Um yeah, so apparently you're supposed to sand it down level again. Lol. I'm usually smarter than that (no comments on that, ahem!). 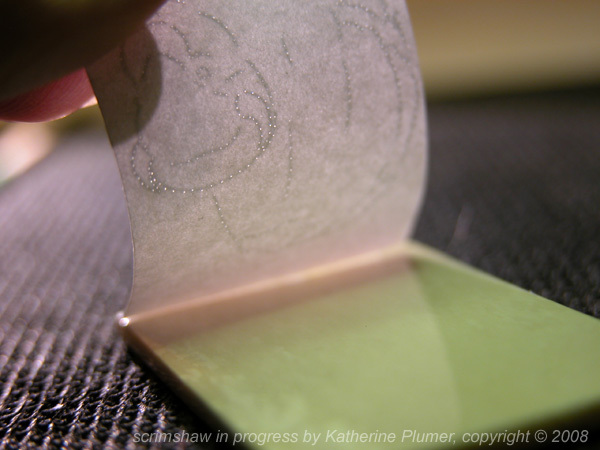 The idea is the glue will seal up the pores even once you've sanded it down. I am trusting those that know more than me (which is a lot of you reading this). I'm pretty low tech, so there's no complicated method here. Just get that glue on there however you can (I just use the tip of the glue container thingy to apply it) and do be careful not to glue it to yourself. Finally time to get to the fun part. Drawing, yay! 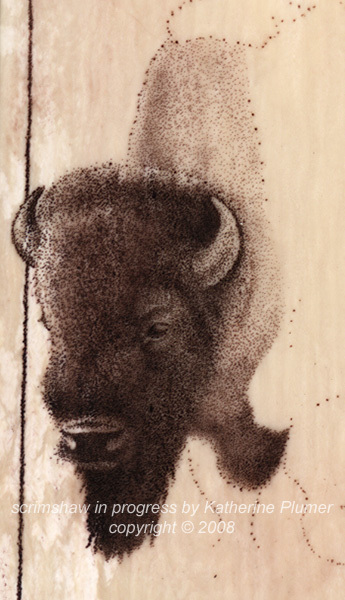 I decided to scrim a bison on this one, because they're cool. I went to Yellowstone this summer with a friend, and we were sitting there waiting for Old Faithful to do it's thing, and this big bison came strolling up right in front of us. It was awesome, and I'm lucky to have had the opportunity to photograph a very cooperative subject. I kinda go the long way with something like this, because I like to draw, and I like to really understand the form of my subject, and get to know it well, so I did a preliminary pencil sketch. I didn't worry about the values, just wanted the draw the form. And then I did an outline drawing from that. 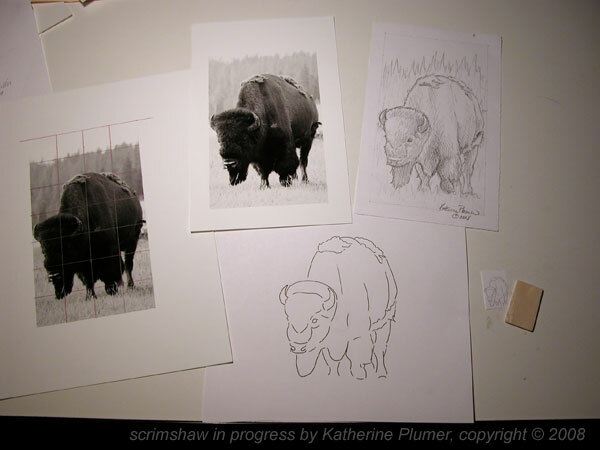 So in this pic you see two printouts of my photos, a drawing, an outline drawing (which I then scanned and shrunk down), and the piece of ivory. Couldn't I just have traced the photo? Yeah, but I didn't want to, I don't like doing that. Although this photo happens to be pretty much exactly what I want to do, there are times when that's not the case and you need to be able to draw your own composition or really understand your subject. As I said before, this is what works for me, other people will have an entirely different approach. 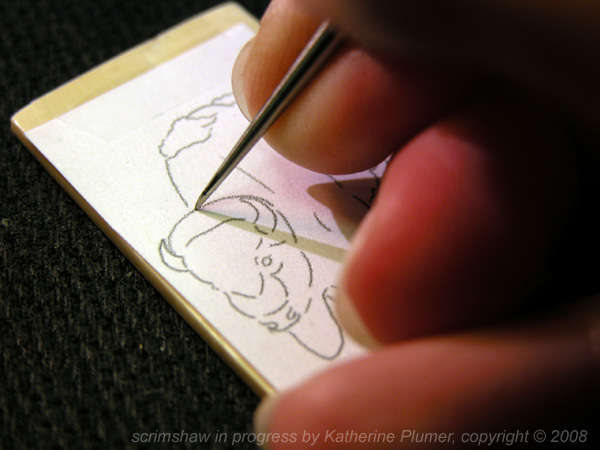 The little printout is taped to the ivory, and here I am transferring the image by poking through the paper. This the steel tipped etching needle I'm using. Normally I'd be holding the piece with my left hand, but the left hand had to take the photo, so yeah this is a little "staged." See, holes in the paper! 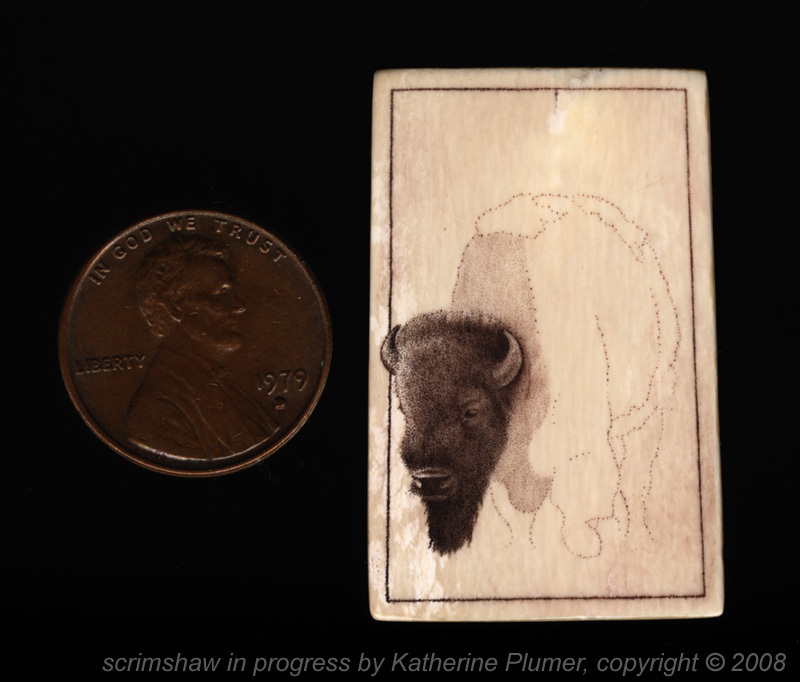 And if you get the light reflecting just right you can see the dots on the ivory. I'm going to use etching ink on this piece since it's not going to be worn or handled after it's done. It'll be framed. I'm using a very dark brown ink, just because I want to see how that's going to look, rather than black. 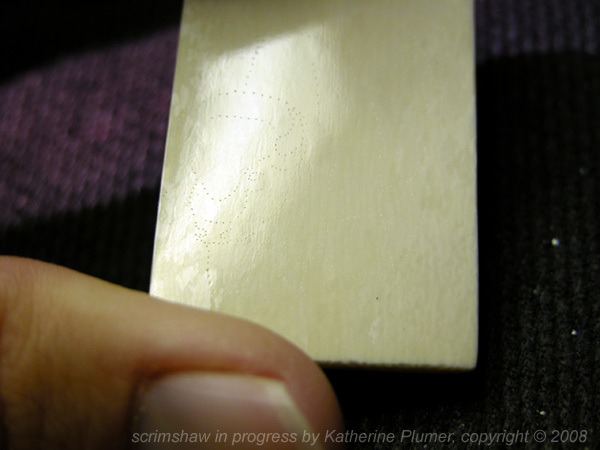 Here's how it looks after inking the transfer dots. Next step (not tonight) is to "connect the dots" and solidify that outline so I can see what I'm doing! I didn't have much time today, so not much progress. 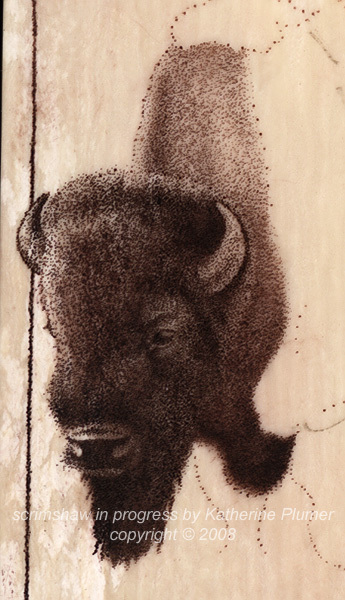 I very lightly (very little pressure) added more dots to the outline of the bison. I didn't want a hard outline, since it's kind of a furry critter, just wanted to get a better sense of the lines, and as you can probably tell these are smaller dots than the original transfer (it'll all work out in the end). And I went ahead and put a border on this because I don't like working all the way to the edge. 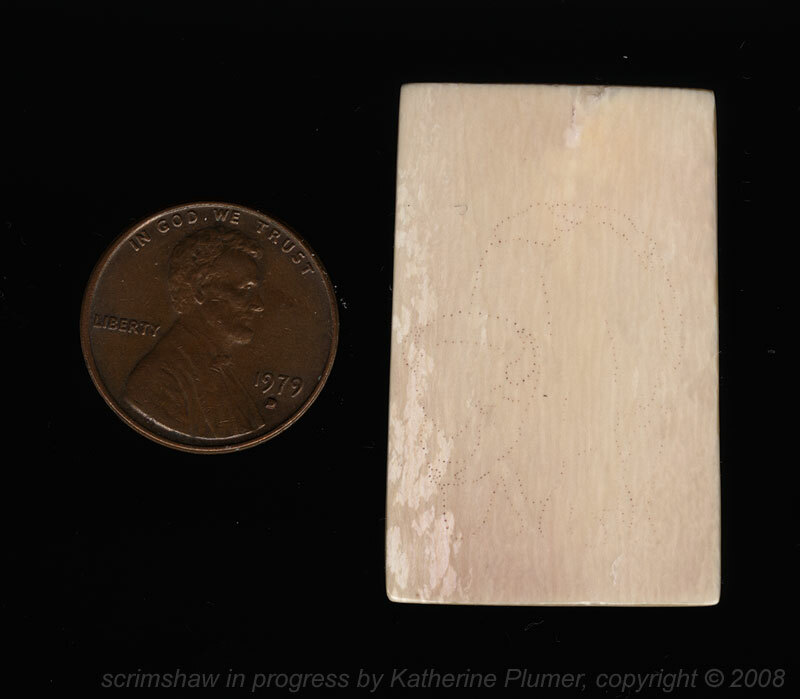 The light colored part of the ivory (left side particularly toward the bottom) is VERY soft. Over-all this is softer than elephant ivory but I'm going to have to be super careful on those pale areas, yikes. I want to say a few words about the photos that you see here. I was asked about doing through-the-microscope pics. I can't, I don't have a camera with a small enough lens. 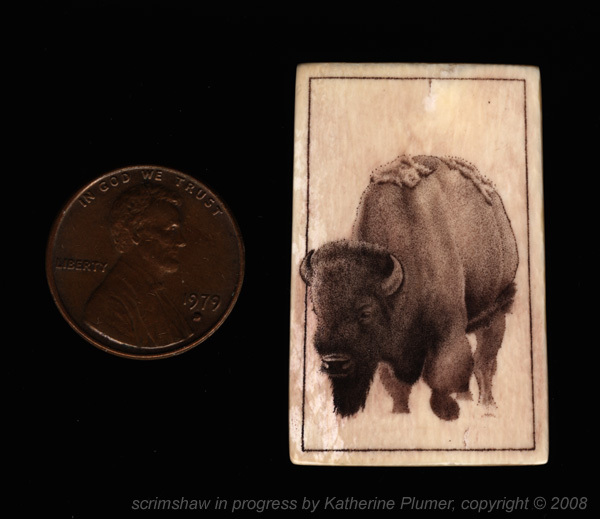 The pics you see that have a penny in them, those are all done on my flatbed scanner. The others are taken with a few-year-old Nikon Coolpix 5700 on which the flash has died but it is still handy for macro and one-handed shots. The other camera (Nikon D80) has even bigger lenses. Maybe I'll get a little camera for Christmas. Okay, back to it! It's been a rough week with a situation in an illustration job that makes me want to do this ---> and it left little time for anything else. Soo.... I'll pretty much just be showing work in progress pics of what I'm doing now. This piece is being done entirely with dots. The ink is dark brown etching ink. It takes quite a while to build it up dark enough. So no part of this other than maybe his horns are done now. There is a lot more work to go on the head. But this is as far as I got today. I'm more or less working on one section at a time here, bringing each one to "almost done" (or maybe done, we'll see how it all ties together). So his head is pretty much done, but I'll probably be doing a little more work on bringing out some texture. What you see there on the neck is kinda like a base coat. I usually put in whatever will be the lightest tone, over the whole section, and then go back and darken as needed. It takes a few passes to get it dark enough. I showed that in the bear tutorial, I can do that here too. So I'm not making any particular effort to finish a section before posting these pics, this is just how far I got today. And a closeup too! I'm trying to really pay attention to whether I make the dots the same size, and I've have to say for the most part I do. It's only on the lightest areas that I lighten up on the pressure (it hardly takes any, especially here, this stuff is pretty soft). But honestly it's so subtle it really isn't that obvious. I primarily achieve tonal variation by varying the density of the dots, and somewhat by varying their depth. I scanned this a few times today to show you how I build up the dark tones. You can always make things darker, but you can't go the other way! So I think it's best to take it slow and build up to where you want it to be. You saw the "base coat" on the neck area in the previous post. I went over it again. I think that'll do. There is often some adjusting to do when the whole figure is done, but I'll decide that at the end! And here is how far I got today. Base coat on the shoulder now. Interesting note: the freshly inked areas look more reddish brown because this ink darkens when it dries. I have to tell you a funny story. I went to see the play "Treasure Island" last night (it's a pirate story if you aren't familiar with it). You know how they ask you to turn off your cell phones and whatnot? 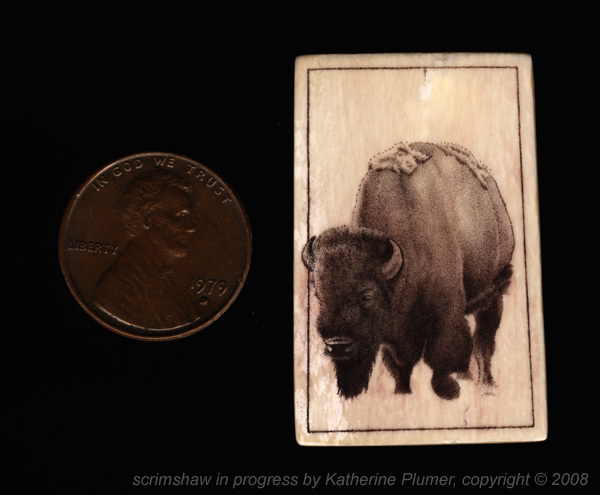 Well among the list of "no texting, no cell phones, etc" during the play they said "and no scrimshaw carving." HA! 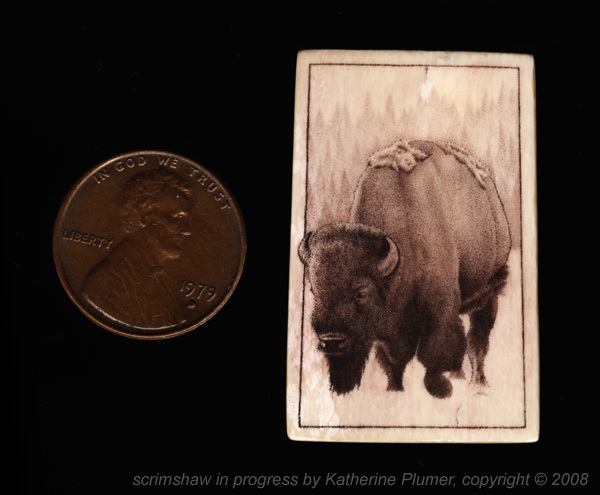 I about jumped out of my chair and exclaimed "he said scrimshaw!" The people around me looked at me like I was nuts. Tee hee. 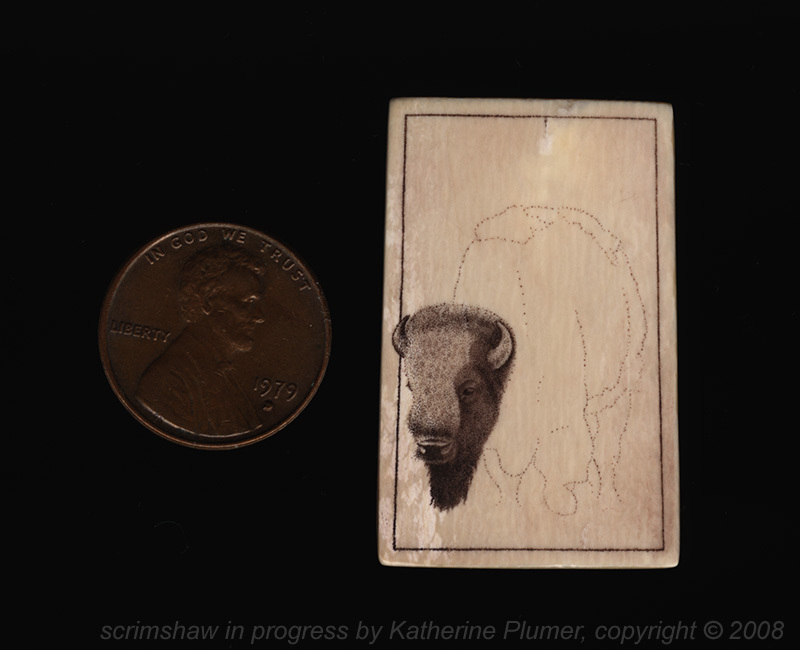 Sooo, anyway, back to work on the bison, I need to get this done asap! 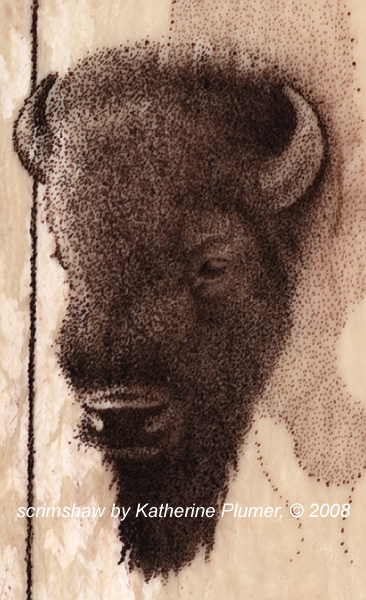 But that Bison's just too pale, so I went back in and darkened parts of his body. This is really tough trying to get him dark enough but also keep enough contrast to keep it interesting! Gosh darn it, there were a couple photos I was going to post here that I can't. Either my camera card or the card reader (the reader, I think) isn't working right and I can only find the USB cable that goes to the OTHER camera. Sigh. Sorry. If it ain't one thing it's another. 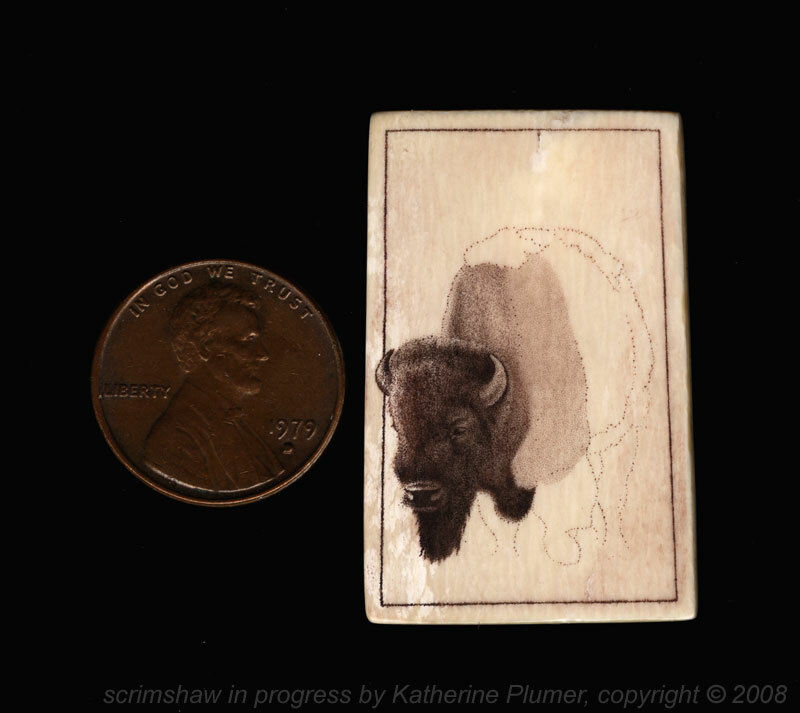 I was going to explain that at this point I did the "final inking" and the pictures were just going to show the little piece of ivory all covered with ink, and the excess ink being wiped off. The last stage is something I would only do on a piece like this that's going to be framed under glass, I'd never do this on something that's going to be handled, because what I'll do is scrim lines into it, and then NOT ink them (which of course is asking for trouble if you plan to handle it a lot, since those lines could pick up ink). So in the foreground I actually added quite a lot of un-inked lines. It really kinda sparkles in person, and now Mr. Bison is walking in a field of pale grass. 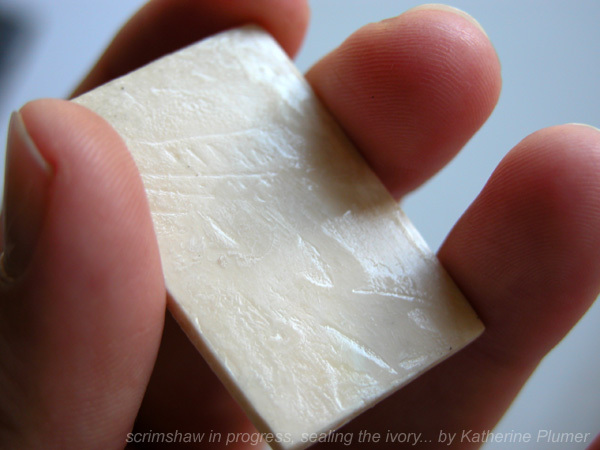 So... what do I think of mammoth ivory? Well, I'll have to do another piece to give you an honest answer on that, because this one was a real pain in the you know what, this was not a good piece. That said, it turned out fine, but really kinda had a mind of its own with cracks and soft areas. I do kinda like how soft it is though, sure makes the dark areas easier! I'll be looking forward to trying another unrelated piece!